George travelled from Stolos, Greece to Regina in 1959 and began working for his brother as a dishwasher. The two quickly had dreams of expansion and in the spring of 1962, George travelled to Swift Current to open the Akropol Cafe in its current location. Helen arrived in 1964, and the two married in 1967 and raised 3 children in Swift Current. 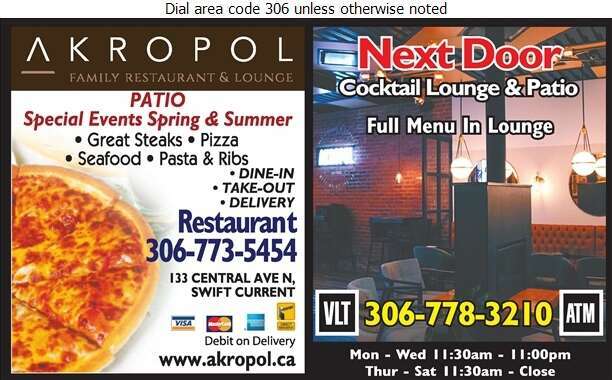 Throughout the last 55 years, Swift Current residents and visitors have enjoyed Akropol Family Restaurant's delicious menu of Canadian and Greek cuisine in a comfortable, family environment. In 1994, their son John and his wife, Rebecca bought into the business. In 2005, Next Door Cocktail Lounge & Patio added a licensed dining area and patio to the family restaurant. Drop by today and make your own family memories.